Budget Director Mick Mulvaney speaks during a meeting in the Eisenhower Executive Office Building on the White House complex in Washington, May 25, 2017. U.S. President Donald Trump's budget director told the Senate Budget Committee Thursday that Republican legislation aimed at revamping the nation's health care law would curtail the growth of health care costs. The nonpartisan Congressional Budget Office (CBO) issued a report Wednesday estimating the bill, which narrowly passed the House of Representatives earlier this month, would achieve $119 billion in savings over 10 years. Office of Management and Budget Director Mick Mulvaney told lawmakers that the bill would achieve savings through "structural changes" that would "put the states much more in control over how they administer health care at the local level." The savings would result from relaxing requirements on the quality of coverage insurers would have to provide and because of cuts in the number of people who would be covered under the current law's expansion of Medicaid, a state-based program for low-income people. 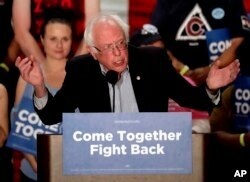 The measure was harshly criticized by independent Senator and former presidential hopeful Bernie Sanders, who said the House bill is reflective of Trump's proposal to cut $3.6 trillion in government spending over the next decade, partially by cutting taxes for wealthy Americans. "If you are a member of the Trump family, you may receive a tax break of up to $4 billion," Sanders said. "But if you are a child of a low-income family, you could well lose the health insurance you currently have through the children's health insurance program and massive cuts to Medicaid." The CBO estimates 23 million Americans would lose health insurance over a 10-year period under the Republican health care bill. U.S. Sen. Bernie Sanders, I-Vt, speaks at a Democratic National Committee rally, April 21, 2017, in Mesa, Arizona. The CBO analysis gives the public an estimate of the impact the measure would have on health coverage, premiums and the nation's budget. In addition to pared down coverage, many consumers would face higher deductibles under the bill, which was narrowly approved 217-213 on May 4. The CBO issued two reports on earlier versions of the Republican legislation, called the American Health Care Act, in March. Both concluded that the bill would increase the number of uninsured Americans by 24 million over a period of 10 years. The reports also projected the bill would increase premiums by an average of 15 to 20 percent over a 2-year period, but push them 10 percent lower than they would otherwise be by 2026. Some conservative and moderate Republican lawmakers abandoned their support for the measure and crafted new language for a revised bill that narrowly won House approval. The new provisions would allow states to permit insurance companies to increase premiums on some people with pre-existing conditions and waive the federal "essential health benefits" requirement. States also would get permission to allow insurers to charge higher premiums for older people. Democratic lawmakers have attacked the changes, maintaining they are designed to victimize people with serious health problems that require expensive medical care. The latest bill would cut taxes by about $1 trillion over a decade, mostly for higher income people and health insurers, the CBO said. It would replace former U.S. president Barack Obama's tax subsidies for health insurance consumers with tax credits based largely on age instead of income.